Quik: Game of the Wasteland, In the despair known simply as the Wasteland, mankind still craves its sport and its sport is called Qwik. Every village, every town has its own team. Drivers - Drivers use their two-handed weapons to knock their opponents out of the match, literally. Chain - Swinging metal chains their objective is to protect their Qwik by keeping opponents at bay. Qwik- Only the Qwik can touch the dog skull. 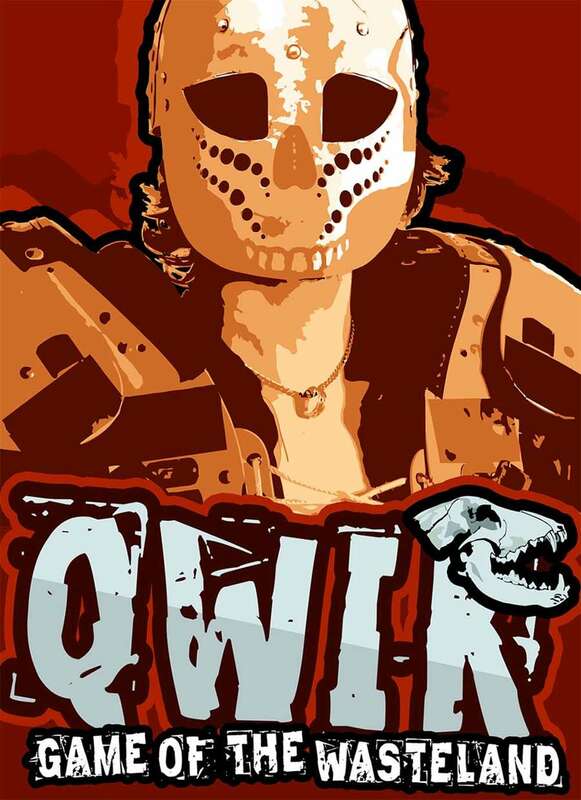 The objective of the Qwik is to fight his way through the opposing team and stick the skull on the opponent's stake, winning the match. You start as the player-manager of a team in the Heart of the Wasteland. Win matches and you get famous, lose matches and the team will disband. Gain better matches until you win your way to the Cities where it's a pie in the sky life and you want your piece! But playing Qwik is not without its dangers. Break a bone, lose a limb and yes maybe even die. What happens when you can’t play anymore? Your team leaves you behind and finds a replacement. HEY, WE NEVER SAID IT WOULD BE EASY! · A full color Qwik field and counters to play your matches. · Rules to create your individual Qwikers and build your team. · Nineteen pre-generated Qwik teams to play against. · Three different Locales to play in from the harsh Heart of the Wasteland to the luxurious Cities. · Campaign rules that cover every aspect of the sport. Your time grows short as you make your way towards the field for your first match. All the training and the pain that you endured to make it here, you hope that it will serve you and your team well. The crowd roars as you, the Qwik, stride to the center of the field. You look across the dirt into the eyes of your opponent, a man as desperate as you. Gong! The game starts. Welcome to hell. Qwik is fully compatible with All Things Zombie, 5150 and other THW games. Can you play a game of Qwik using your characters from other THW games? Yes you can!